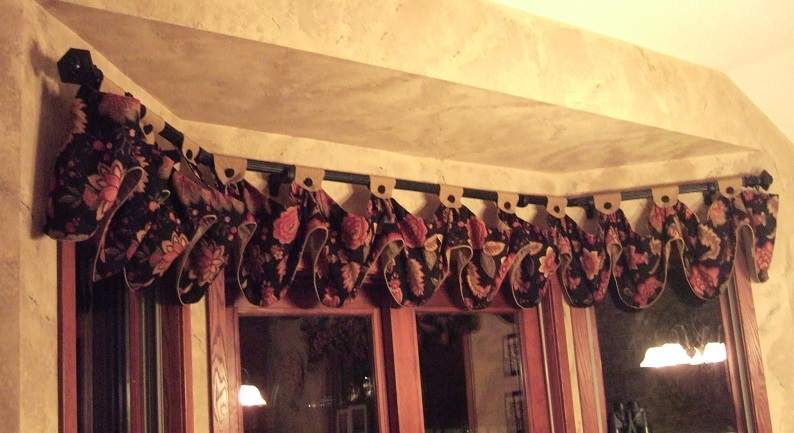 Valance over bay window delivers dramatic design solution - Sew What? Sew Anything! This fabric had been purchased by the homeowner many years ago. She was looking for valance over her bay window that would add just the right fun to her kitchen design which featured a big bay window. Now, there can be some challenges in working with fabric that has been pre-purchased, especially some time ago. What will you do if there is not enough? What about matching a fabric that may have faded over time? The big bay window was my challenge and inspiration. A coordinating fabric was selected for the tabs and cording, this added drama and really set-off the customer’s fabric. By adding the buttons we were able to give this window treatment an added detail. A smaller valance for a side window was also made for this kitchen. We successfully created two window treatments with the existing fabric and coordinating additions making a dramatic statement for the bay window. At Sew What? Sew Anything? we are always up for a challenge, especially when we can deliver results like this valance over bay window.